Lacking an efficient hybrid production system in mustards, the advantages of increased hybrid vigour and yield have left Prairie mustard growers wanting more. 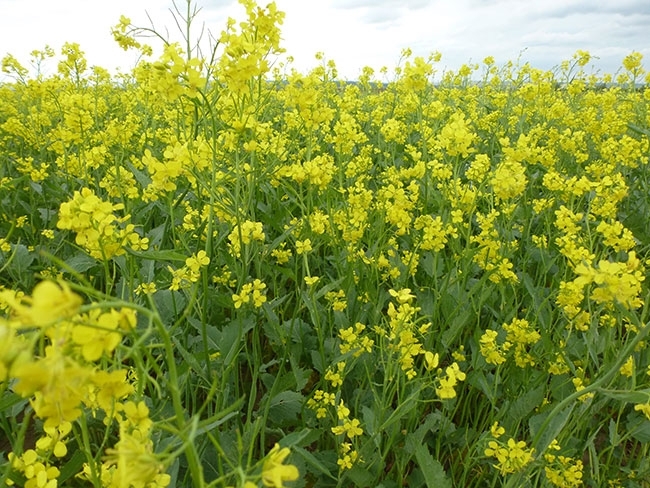 However, a breakthrough by Bifang Cheng, Agriculture and Agri-Food Canada’s mustard breeder in Saskatoon, has made hybrid brown and oriental (Brassica juncea) hybrid development a reality. The first hybrid brown mustard, B3318, was supported for registration in 2018. “I directed our breeding approach and efforts towards improving the Ogura CMS [cytoplasmic male sterility] hybrid system in brown and oriental mustard since April 2009,” says Cheng. The challenge for Cheng and her colleagues was that the improved Ogura CMS hybrid system used in hybrid canola breeding was not available in mustard. The unimproved B. napus Ogura CMS hybrid system was originally transferred into B. juncea by researchers at the French National Institute for Agricultural Research (INRA). Brassica juncea is self-pollinating with male (anther) and female (stigma) reproductive parts on the same plant. Pollen from the anther fertilizes the stigma. But in hybrid production, two different parent lines are crossed to produce an F1 hybrid. To achieve this, breeders make one of the parents male sterile so that the two parent lines cross-pollinate. In the Ogura CMS system, the cytoplasm surrounding the nucleus of a cell from a radish plant is used to turn off male pollen production (Line A). This parent line is crossed with a fertile Line B to produce an out-cross, which is still male sterile. A restorer line (R) is then crossed with line A to produce fertile F1 hybrid seed that farmers grow. Agriculture and Agri-Food Canada’s Saskatoon Research and Development Centre obtained the B. juncea Ogura CMS male sterile (A) line VR01-7239 and restorer (R) line VR03-10612 (RfoRfo) from INRA in France. However the restorer line contained a large radish fragment and had reduced male and female fertility as well as poor vigour, low fertility and was black-seeded due to linkage drag. Cheng’s work focused on improving the restorer line so that the Ogura CMS hybrid system could be successfully used in B. juncea mustards. “We designed a novel strategy to address this issue and successfully developed the improved Ogura CMS restorer line VR441 (RfoRfo) with drastically reduced linkage drag, good seed setting and strong growth vigour within one and half years,” Cheng says. Since the development of the improved Ogura CMS breeding system, Cheng has used it in her mustard and canola-quality B. juncea breeding program. B3318 is a brown mustard condiment hybrid that yielded an average of 24 per cent higher than the check variety Centennial Brown in yield trials and Co-op Mustard Test in 2016 and 2017. It exhibits resistance to white rust race 2a, but is not as good as the disease check variety Amigo. B3318 also has similar blackleg resistance as Amigo. It has two per cent higher oil content, 1.3 per cent lower protein content, lower allyl glucosinolate content and smaller seed size than Centennial Brown. There will be limited seed of B3318 available for planting in 2019. Mustard 21 Canada Inc., a non-profit corporation initiated by the Saskatchewan Mustard Development Commission (SMDC) and the Canadian Mustard Association (CMA), is managing the production and launch of B3318. The plan is to gather on-farm experience across the Prairie mustard growing areas with 160 acres of B3318 per grower in 2019. In 2020 Mustard 21 hopes for a full launch with commercial availability for 50,000 acres. Cheng continues to work on additional hybrid brown mustard varieties. In 2017, she had 29 test varieties in AAFC yield trials. Additionally, she had 29 oriental mustard hybrids in AAFC replicated yield trials. The goal is to have an oriental mustard hybrid registered for 2021. Developing a hybrid production system for yellow mustard (sinapis alba) is more challenging. Yellow mustard is self-incompatible, meaning the plants out-cross with other yellow mustard plants rather than self-pollinate. Currently, a synthetic yellow mustard variety is planned for release in 2020. Synthetic varieties are a blend of two or more parents in the same bag. These multiple parents out-cross in the field to produce a level of hybrid vigour, although not truly considered a hybrid. Canada is the dominant exporter of all three mustard types. Brown mustard mainly goes to Europe where it is made into Dijon mustard. Oriental mustard goes to Asia where it is preferred for its hot flavor. Yellow mustard is the traditional hot dog mustard and much of it is exported to the United States. Yellow mustard acreage is dominant in Western Canada. Kevin Hursh, executive director with the Saskatchewan Mustard Development Commission says that hybrid mustard production will help to keep Canada competitive in the export market. He says concerns that hybrid mustard will simply produce greater supply and result in lower prices to farmers are not valid. Hursh says that mustard demand is also slowly growing. With good prices, Canadian growers will benefit even more with hybrids. During periods of lower prices, the hybrid yield advantage will help maintain profitability. “I think hybrids are a win-win situation for mustard growers,” Hursh says. Is hybrid wheat the next great crop innovation?